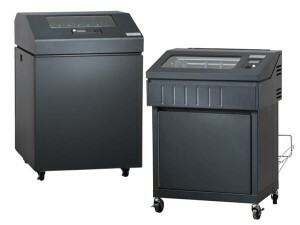 The TallyGenicom 6810 line printer is available with a quiet, enclosed cabinet or you can choose a pedestal model. It prints up to 1000 lines per minute. It’s a fast, tough and reliable line printer. The cabinet model of the TallyGenicom 6810, protects your printer and improves reliability. It knocks down the noise. Great for office environments. Quiet and versatile. This printer can handle your most important print jobs. You’ll be able to run your large, unattended print applications for years to come with this tough, reliable line matrix printer. The TallyGenicom 6810 line printer adapts to almost any supply-chain or back-office environment. PowerPrint™ delivers improved print clarity and print darkness on multi-part forms by increasing impact energy. PowerPrint is a standard feature on TallyGenicom 6810 printers with a 1,000 line-per- minute print speed.